I had a feeling that the new build roof might go on quickly. And I was right. It did. The only lunchtime my timetable allows me out of school this year with any comfort is a Wednesday, but I didn’t want to risk leaving it a full week at this particular stage in the process. As I was meeting a friend after work anyway on the Monday evening, we decided to walk up to Tankerville before heading off into Town. 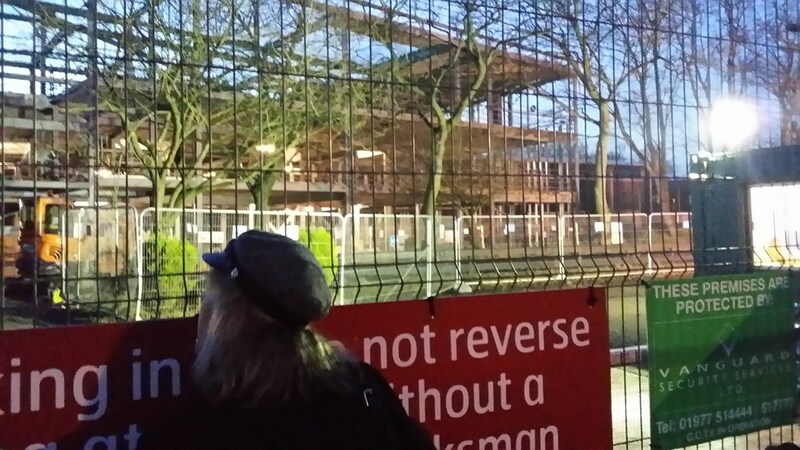 Me peering through the gates at the flood-lit new build site. Having struggled with the vagaries of winter weather for so long, it was initially a bit of a shock to the system to see the building bathed in light. I don’t know why I hadn’t realised the site would be flood-lit at night for security purposes. This turned out to be the perfect way to photograph the progress of the roof now being put into place. Grey steel against grey sky had been causing me some issues recently, but shiny, silver steel flood-lit against a darkening sky was ideal. Only a small area was covered so far, but it still looked impressive. 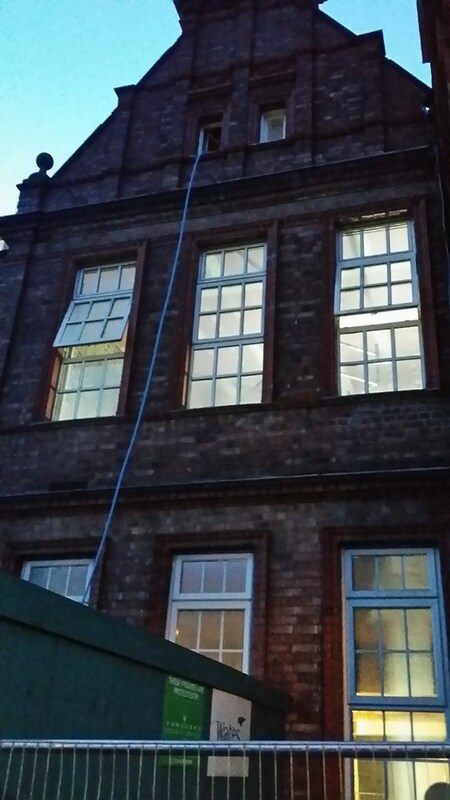 The first section of new roof is foregrounded as dusk falls . It is usually the opposite way around for me, but this evening it was not the grey new-build structure but the old building that lacked warmth, brooding in the shadows beyond the range of the lights. 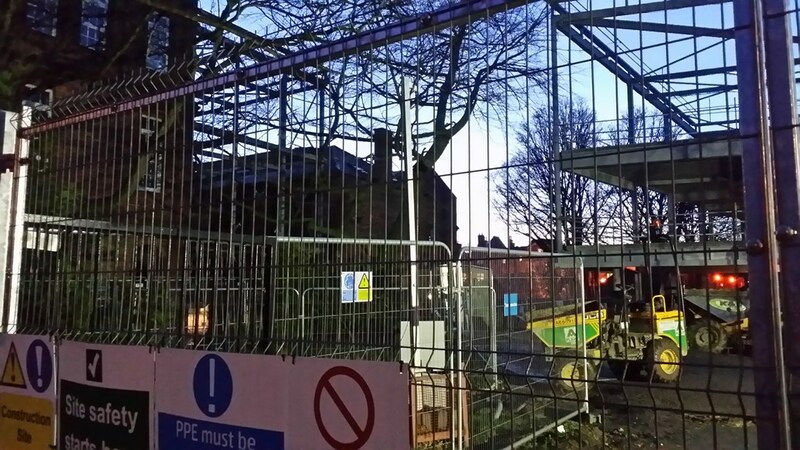 Through the criss-crossed wire fencing and dark twisty branches of the big tree, it was a strain on the eyes trying to discern any changes to the steelwork of the new circulation extension as dusk was falling. In contrast, the old building to our left lurks in the shadows. At this point, right on cue, two late shift workers emerged from the cabin. This wasn’t the first time – and no doubt won’t be the last – that I have had to explain my motivation for poking a camera lens through the site gates. Neither was it the first time someone has offered to help me out – and hopefully it won’t be the last time either! 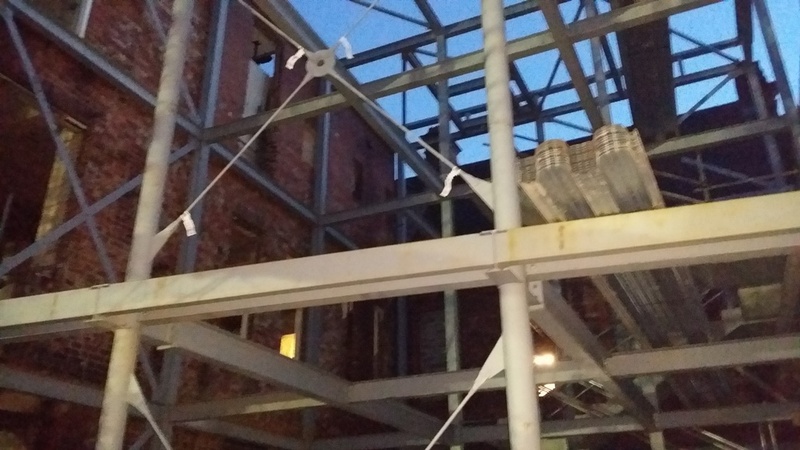 When I got back home, the shot of the old build extension frame taken for me by a kind gentleman showed steel flooring ready to be laid. Metal flooring waiting to be laid in the old build extension. The reversals tonight were not just visual, but aural too. 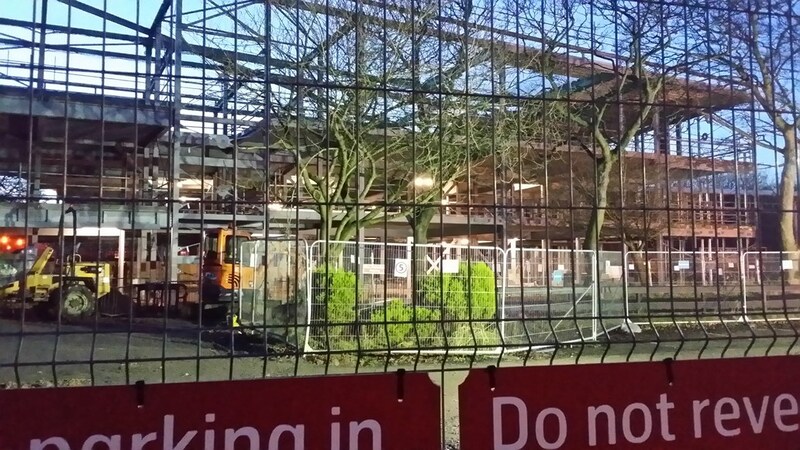 The new build site in the day-time is usually abuzz with the sound of machinery at work, but, tonight, the only noise was occasional ‘clanking’ sounds emanating from within the old building itself. I remembered hearing that Wates had applied for, and had been granted, a slight extension to their interior working times. Tonight, as we passed illuminated windows, it was impossible not to try to sneak a peek inside. The old building is all lit-up inside.